As a writer of suspense / thrillers with quite a lot of police procedurals, I was bound to come across this kind of question within myself – should I, or should I not, include details of killings such as gory scenes, or torture? I’ve previously stated that I prefer to keep away from a lot of gory details, and I don’t actually enjoy reading some of it myself. I’m the type of person who never went to watch horror movies, and hides under the bed covers when scary foretelling “something bad is about to happen” music comes onto the television. On the other hand, I don’t enjoy particularly cosy mysteries either, and importantly – I want to work with the reality of crimes, and their impact on victim’s family and friends also. 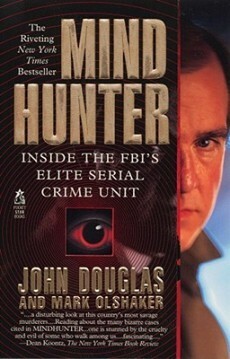 I’ve just finished reading John Douglas’s book “Mindhunter”. This is a look inside the setting up of the FBI’s Investigative Support Unit / Behavioural Sciences Unit – colloquially called “profilers”. John Douglas was one of the forefathers of the unit, and worked as the first full time profiler through the 1970’s and 1980’s. The book mentions just about every famous serial murderer or killing case going in America during those decades, and includes some in the U.K. also. John Douglas or team members had their hands in most of those cases in some capacity. After jumping about in all of those true crime cases, Douglas makes a emphatic point on how such crimes affect not only the victim’s families, but people in law enforcement like himself. He admits that his own obsession over covering as many cases as he could led ultimately to the destruction of his marriage, and certainly to a chronic health problem later on. The book, in some places, speaks openly of the details of an often tortuous or sexually sadistic murder scene. Such motive operandi’s and signatures to the crime are what profilers require to form an idea of who might have perpetrated the killing. Some authors have large followings because of the details. I remember reading Serial Killers Uncut, an amalgamation of books by JA Konrath and Blake Conrath where I was reeling from some of the very graphic details of torture and mutilation the many serial killers did to their victims. So saying that, the quality of writing by the authors meant I continued to read, despite my reservations. As writers, we each have to make decisions about the depth of detail, and what percentage of our fiction becomes more akin to our unpleasant realities. Thrillers and crime fiction have a duty to give the reader some resolution to all those details – we want and need the crime to be solved, the bad guys to finally get what’s coming to them. To tell the tale, we make decisions on just how much of the story can be told. Things have changed over the proceeding decades since Douglas published his books. The FBI changed in itself. In the U.K. profiling as a skill, was seriously discredited for sometime, and is only recently returning with a far more statistical basis. In America, at least, crime writers seeking real knowledge, can go on a training course in police procedures created for writers. Books are now available to help writers in my genre understand forensics, guns, poisons, and of course – psychology and criminology. Our fiction is becoming more grounded in facts and realities. (Part of that reality is found in Mindhunter, and similar books). There is a huge audience gobbling up television shows such as Criminal Minds, Law and Order, SVU, and the like – even repeats. There is also a fascination in reading about true crimes, one of the biggest growth areas in non-fiction at the moment. Yet, the fiction reading likes and dislikes of our general audience is still something different. I read recently on a forum or blog post where one thriller author posted that she knew the way to get hate mail – it wasn’t from hurting fictional children like everyone presumed, it was because her latest book involved the killing of a dog. She told everybody that if you fictionalise the torture of animals you will become the world’s most hated author for a while. Other readers and writers have stated categorically that they won’t go near crime fiction that involves the killing or hurting of children. Unfortunately, one of my books will involve the killing of children – because I want to deal with the mentality of the killer behind it (and it answers the statement that we all, as parents, have been found to say at some time or another – If somebody hurts a hair on my own child’s head, when I say I’m prepared to kill that person, is it really true?) . Such people who don’t read fiction dealing with hurting children are entitled to their own likes and opinions, but sadly may not be part of my own reading audience in the future. Still, I am always intrigued by the psychology and thinking behind readers like me, and how it may affect my own writing. For me, there is a fine line between showing a crime, and going into minute detail. I also don’t like fade outs, leaving the reader to conjure up exactly what happened in their own imagination. If I take them to the crime, I want to show the full story. This is a juggle for any writer in the suspense / mystery or crime genres, I am sure, and can only be answered individually. But if you care to comment, please do so. What do you personally draw the line at, in fictional crime? Hmm. Personally, I don’t mind fictional killings, whether the victim is an animal, an elderly person or a child, but I do not like them to be gory. Some writers go over the top and write really gory scenes, and that puts me off. For Paula and Zen, I agree with you both. I find the mental aspects more appealing, but I do prefer to “see” the actual crime itself, just without too much gore. Defining gore is another matter – for me, blood is okay, but being described innards or eyeballs being pulled out, that’s different. Luckily, I don’t plan such gory murders in my own stories. Phew.